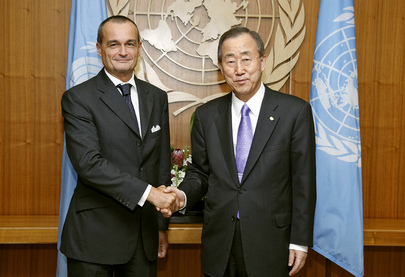 UNITED NATIONS, March 24 -- After the UN Security Council's two hour meeting about its Resolution 1973 on Libya, among Council members only France's Gerard Araud came out to speak to the press. France alone has recognized the rebels based in Benghazi as Libya's government. Of course that doesn't answer the question. Is France arming the rebels? Does it believe that it would be legal? If so, just say it. Informed Council sources on Thursday described to Inner City Press what Susan Rice of the US said in the run up to adoption, with five abstentions, of Resolution 1973. Rice said the US needed the “notwithstanding” exemption to the arms embargo if it needed to go into Libya with weapons if, for example, an American pilot were shot down. But, the Council member told Inner City Press, it was not argued that the language permitted the arming of the rebels. Now France won't answer the question, and Rice is not at the UN. Inner City Press notes, as for example Andrea Mitchell publicly has, a recent death in Rice's family. But other journalists pointed to a “blizzard” of press statements e-mailed out ostensibly from Rice about human rights in Iran, accompanied by Tweets. Inner City Press replied via Twitter asking for an explanation. If and when one is received, it will be reported -- and re-Tweeted. Footnote: Ban Ki-moon spoke only briefly in the Council chamber, and held a highly controlled stakeout afterwards. No question were taken or allowed on whether and why Ban recognized Gaddafi as head of state while granting UN passes to Dabbashi and Shalgam, nor about his envoy Al Khatib being a current Jordanian senator, in presumptive violation of UN Charter and rules. Even so controlled, Ban said very little. There is grumbling. Watch this site.